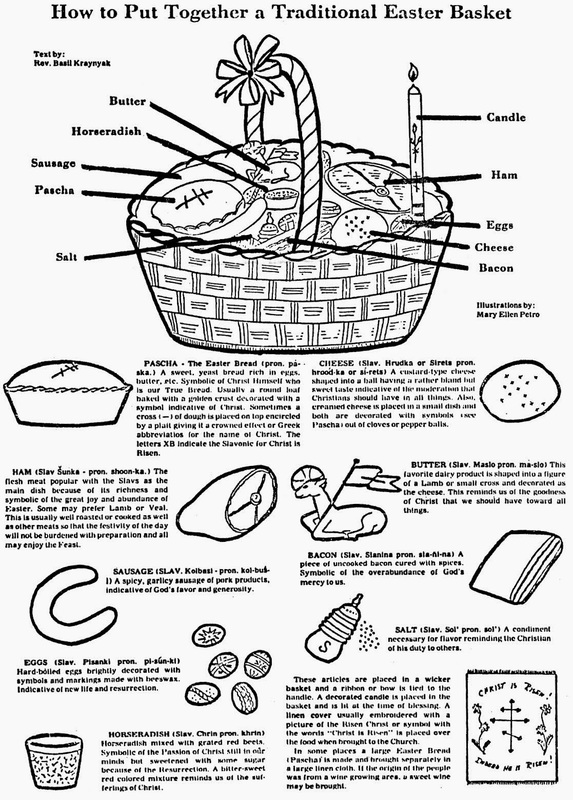 If you are looking for ways to keep "Christ" in your celebration of Easter, consider making an Orthodox Pascha Basket instead of the typical egg & candy overload! Each of the following traditional foods has a symbolic and spiritual significance. 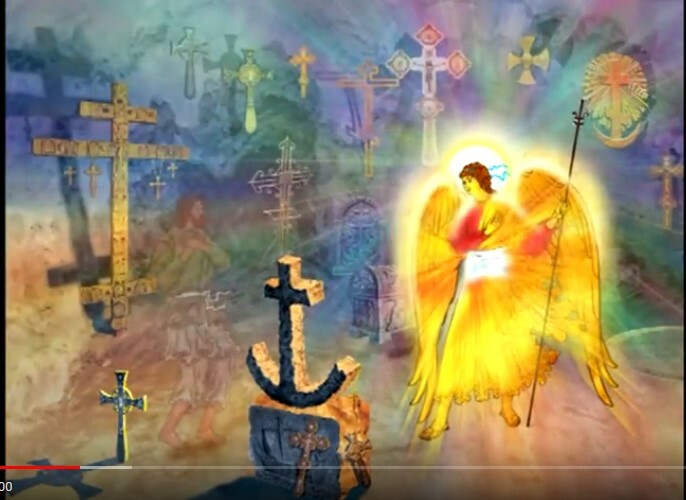 We focus on saying "Pascha" which encompasses our spiritual journey to the Resurrection of Christ, and is our "passage" from the Hebrew "pesche, or passover from death to life." Each year, the Church follows the same sequence of events - and one can't happen without the next. I encourage you not to skip right to the Resurrection without going thru the Cross. Living each component in correct Orthodox theology is truly "Orthobiosi"
...Christ raising Lazarus, Christ's Entry to Jerusalem (Palm Sunday), Christ's arrival to those anticipating Him (Bridegroom) the Passover (Christ's Mystical Last Supper on Holy Weds and His washing of the disciples feet) the Crucifixion, Burial and Tomb, all culminating at the glorious Resurrection of our Lord. 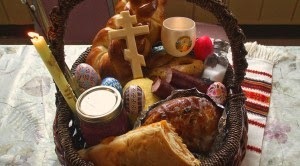 Many parishes will bless the baskets all together after the Divine Liturgy on Saturday morning. Ask your local priest to try this custom! cheese, meat, butter, salt, and a red egg. Sweet bread is always included, leavened with yeast. This is a symbol of the New Covenant; the Jews made unleavened bread, and we, the children of the new covenant, make leavened bread. Kulich is the traditional Russian bread, and Tsourekia is the traditional Greek braided bread. The braided form of this bread is a display of the Trinity - 3 in 1. The bitter herb, often horseradish or garlic, serves as a reminder of the first Passover (horseradish is eaten as a traditional part of the original Passover meal) and of the bitter sufferings which Christ endured for our sake. Sometimes the herb is colored red with beets, symbolizing the Blood of Christ. The bitter herb is also to bring to mind the Jews’ 40 years of wandering in the wilderness, or our 40 days of the fast. The red egg, which we crack, is likened to the tomb from which Christ arose. This is because of the miracle of new life which comes from the egg, just as Christ miraculously came forth from the tomb, shattering the bonds of sin. 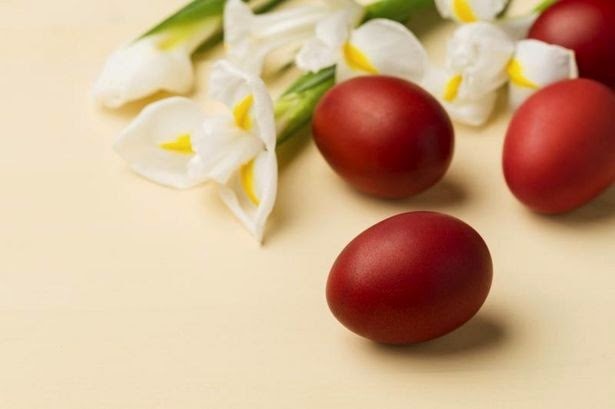 Of course, red for His blood shed for us, and the miracle from St Maria Magdalane when the egg in her hand miraculously turned red as she proclaimed "Christ is Risen" to the non-believing Emperor. Many Orthodox Christians also cover their basket with a Pascha basket cover. Here and here are some more links on Pascha Baskets. Can I use this post in our parish's Christian Ed Newsletter? I will credit back to your blog. the pascha handout only comes up as "text"
Hi, I just found your blog when I was looking for materials for the Religious Education class I team teach at my local parish. I am so overjoyed at the wealth of resources you provide. I look forward to utilizing them. There is so much that the Catholic and Orthodox Church have to share. Thank you for posting all these wonderful resources. Peace be with you. Post of July 17, 2017. For the record, "Be fruitful and multiply" (Gen 1:28) comes immediately after "He made him: male and female He made them" (Gen 1:27). Yes you will find in holy Scripture God foresaw the fall, however in Chapter 4, St John Chrysostom shows us that Adam "KNEW" Eve. This is the correct understanding of this term, sexually as man and woman. There was no sexual union in Paradise before the fall.